So you’re contemplating building an addition. Good for you, but be forewarned. Building a home addition is certainly a great way to add living space to your home and it can also increase the value of it, however building an addition takes a great deal of work and effort. It is not a project for the faint of heart, and nor is it for the person who deals poorly with disruption and change. Over the years I have built many additions, as well as acted as my own general contractor on a few of them. 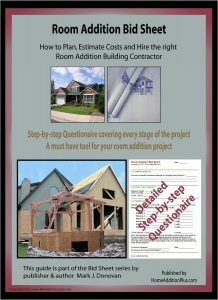 From my personal experience the two most critical items in building an addition are project planning and hiring the right contractors. The bottom line, if you neglect to do your upfront homework in fully specifying your home addition or you don’t fully vet out prospective home remodeling contractors you will pay in time, money and headaches. When planning the construction of your home addition, realize that you are effectively building a small home, but with the extra complication of having to attach it to your existing one. There are literally hundreds if not thousands of decisions that you will need to make during the planning stages. One of the key secrets of building an addition is to leave nothing to chance or for a later date to figure out. 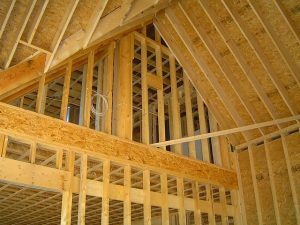 Plan out every feature in the home addition, including its physical location relative to the rest of the house, all the materials to be used in its construction, and every subcontractor required for the project. Also make sure to check with the local building inspector and zoning board to make sure you meet all the zoning and building code requirements for your addition. 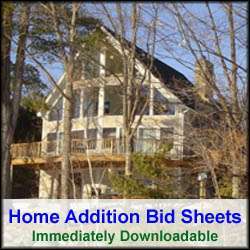 You may also want to meet with an architect to develop your home addition plans. In addition, if you have already selected a general contractor you may want to have them weigh in on your building addition plans. Talk with neighbors, friends and/or relatives who have recently had their own home addition completed for locating home remodeling contractors. Also check the phone book. Alternatively, there are online contractor referral companies that have national databases of qualified and pre-screened contractors and subcontractors. Simply fill out their free online form and a few local contractors in your area who are part of their database will contact you for quoting the building of your addition. There is no cost or obligation to you on using these types of contractor database services or contractors. For more information see find a local contractor in your area. Building an addition is an expensive proposition and unless you are flush with cash you will need to secure financing. Check with local banks to understand how much financing you are eligible for, and to understand their lending rates and other terms and conditions. Once you have a complete set of building addition plans in place, accurate cost estimates, and a contractor and financing secured, it’s time to actually pull the permits to enable construction to begin. You or your contractor(s) will need to pull the permits and make sure they are properly displayed on the job site. With all the upfront planning and work completed you can actually break ground on your new project, literally. First the foundation hole needs to be dug, followed by the pouring of concrete footers, foundation walls and/or concrete slab. Then they need to be backfilled after adequately curing. Once the footings and foundation walls/slab floor have been poured and have had time to cure, the actual framing of the addition can begin. First the walls, followed by the roof, are framed in and sheathed. The roof is then shingled and the doors and windows are installed. An inspection by the local building inspector is usually necessary at this point. After the addition has been buttoned up from the weather, the plumbing and electrical trades can then begin to do their work in earnest by roughing in the plumbing and electrical. Once they are complete, another inspection is typically required. After the successful inspection of the rough plumbing and wiring, insulation can then be installed. Again, another inspection may be necessary after insulating the addition, depending upon local building code requirements. Once the insulation has been installed, the drywalling, taping and mudding phases of building an addition can begin. Upon their completion, typically the walls are immediately painted. Then the electrician and plumber can come back in to begin their tasks of finishing the electric and plumbing. In addition, finished carpenters can then install interior doors, and window and baseboard trim. Tile flooring can also go in at this stage. Likewise, kitchen and/or bathroom cabinetry can also be installed at this point. From there, any additional flooring can be installed (e.g. carpeting) and the final finishing touches to bathrooms (e.g. hanging of shower doors and mirrors, etc) can be completed. With the finishing touches complete, all that is left to do is to call in the building inspector for the final inspection of your newly built addition. Upon the successful inspection and final payment disbursement made to the contractors, you’re ready to move into your newly built addition.